It’s days like today, a beautiful summer day in Maine, when I really miss having a dog. There were few things more fun than getting some “me time” with my dogs, both on leash and off. It gave them (and me) exercise that we both needed. It helped increase the bond between us. They got to develop their social skills with people, and with other dogs. But like a lot of things, it took work to make it happen. First, make the time and effort to teach your dog to walk properly on leash. You need three things: Time, patience, and the right equipment, that being a proper leash and collar. Start in a quiet area with few or no distractions, like your living room. Gently go through the same routine, over and over: Have the dog sit, attach the leash, and then give a food or praise reward for their good behavior. Positive reinforcement it the key: Remember, dogs love treats, but for many of them your praising and petting them means more than any jerky treat. If the dog starts to walk away once the leash is attached, gently call them to your side, saying “come.” Again lots of praise and a treat when they do this properly. Work up to walking along, and if they pull or wander, resist the urge to pull them back: Stop, get their attention, and call them back, rewarding them when they do it. Sound boring? Well, yeah, it is, but it can change “walking the dog” from a chore to a joy. It is important to do this slowly and in stages: Progress from walking with them near you to having them walk at heel. Some dogs will pick up on it faster than others, but virtually all of them will get it. The real test is to get them to walk and behave out among distractions, like people and other dogs, when they will get all excited. Remember to keep it positive, with praise and reward, rather than shouting at or scolding the dog. It will actually make it more fun for you and your dog if you can work together as a team. The equipment you use can make a big difference. The collar is important: Although I know that there is no one item that works for all dogs, I think the head halters (such as the Halti or Gentle Leader) are wonderful. They are fantastic for gently keeping the dog from pulling or jumping up on people, and can also be used to close the dog’s mouth if they like to “nip” when excited. I’ve had a couple people complain that their dog doesn’t like the head halter, but the vast majority will get used to it with time and patience. Some people like using “prong” or “pinch” or “choke chain” collars, especially with large, powerful dogs. While these collars do have their place, they should primarily be used for training only, rather than being regularly used to walk the dog. A dog constantly straining against a prong or pinch collar risks damage to the skin or neck. If you have a small dog, one under 20 pounds or so, strongly consider getting a harness for walking them. Many toy breeds have very sensitive tracheas that can be damaged by the pressure of pulling against a collar. Some dogs can do well with one of the “no-pull” harnesses, but in my experience the results are very mixed. There are times using one of those “no-pull” halters on a lab that I feel like I am water skiing behind the dog. Second, remember: Although you love your dog, not everybody does. Other folks shouldn’t be forced to have to meet your dog or deal with them. Some people are allergic to dogs, and break out with just casual contact. Some poor folks are terrified of dogs (yes, even your adorable labradoodle who just wants to give them a kiss). In my job I have seen dogs who run up off leash “just to visit” get kicked, punched, and, on one occasion, shot when the person they approached thought they were being attacked by the dog. Be smart: If you have them off leash, make sure it is in an appropriate location, like an off leash park or similar situation. Finally, set them up to succeed, not fail. The time spent training them is well worth the investment. If you know your pet is not good off leash, don’t take them someplace where they can just run off: Use one of the fenced in play areas. If they don’t get along with other dogs, walk them in isolated areas away from other pets. Plan ahead, and you and your dog will have a great time together. 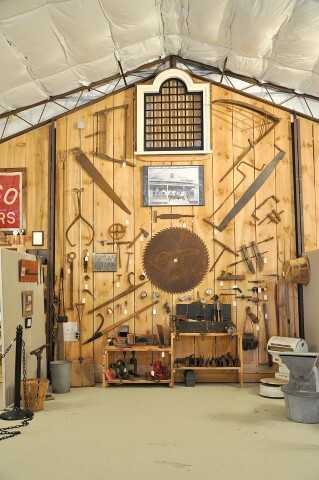 The Raymond Casco Historical Society Museum on Route 302 in Casco is a treasure, hidden in plain sight. Though the bright red building is hard to miss with its extensive mural of the Raymond steamboat dropping off passengers to be picked up by the Casco stagecoach it doesn’t always inspire people to stop and check it out. But it should. Inside the large building a wide range of historical artifacts details the history of the two towns, which began as one community called Raymondtown, according to RCHS president Frank McDermott. The town hall for Raymondtown sat in the same place as Raymond’s current town hall on Route 85. The long drive from Casco to visit the town hall prompted the split into two towns, McDermott said. With the common history, it only makes sense to have a common museum, he added. The RCHS is a 45-year old organization, started by Ernest Wright, who was active in the society until his death. 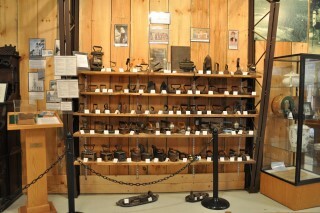 A collection of books by Wright is for sale at the museum. These books include two volumes that showcase historical pictures and modern photos of the same location side by side, a collection of old historical society newsletters and more. The purpose of the society is to preserve the history of Raymond and Casco, McDermott said. One of the challenges is the movement of people, he added. “Casco still has some old families, but Raymond doesn’t. The old families have gone by the wayside,” he said. When families haven’t been in the towns for several generations, history doesn’t mean as much to them, he said. The work is not easy, McDermott added. There are only about 10 active, working members in the RCHS, and there is a lot to do. In addition to the museum, the society operates the Friends Schoolhouse in Casco Village. They have just begun discussions with the town to move the schoolhouse to the museum site, to consolidate activities. But until that happens, volunteers are split between the two. They have just enough people to keep the museum open for a couple of hours three days per week, with two volunteers present each day. “The people who do it do it for the love of it, and it’s been a lot of fun. We’ve learned a lot along the way,” said McDermott, who along with his wife is a charter member of the society. 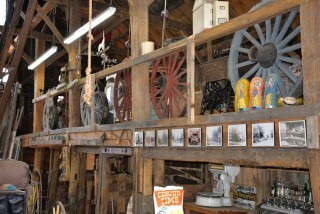 The museum collection is spread between two buildings – the main museum and the old barn from the Watkins farm. 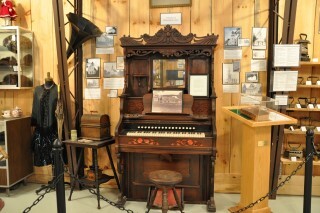 Displays are unique and varied, including photographs of the Wilson Spring House, an early competitor of Poland Spring, an exhibit on Princess Goldenrod, a local Native American entrepreneur in the 1950s, Casco High School memorabilia, and much more. The barn houses some of the larger items, including soda fountain and advertising memorabilia, collections of tools and farm equipment. And out back a surprise awaits visitors in a third building, the classic antique automobile barn. 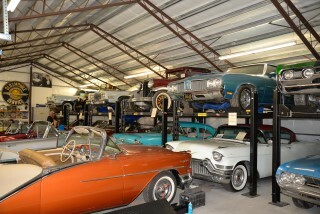 Skip Watkins, who donated the land and built the museum for the society, and leases them the historic barn, houses his vast collection of restored classic cars here, which the historical society can show to visitors. The RCHS is funded in part by the towns of Casco and Raymond, with each community contributing $1,800 per year to the society. Other funding comes by way of donations and special events. Museum admission is by donation, rather than a set admission price. In early August, the museum will host its annual Antiques & Collectible Appraisal event. 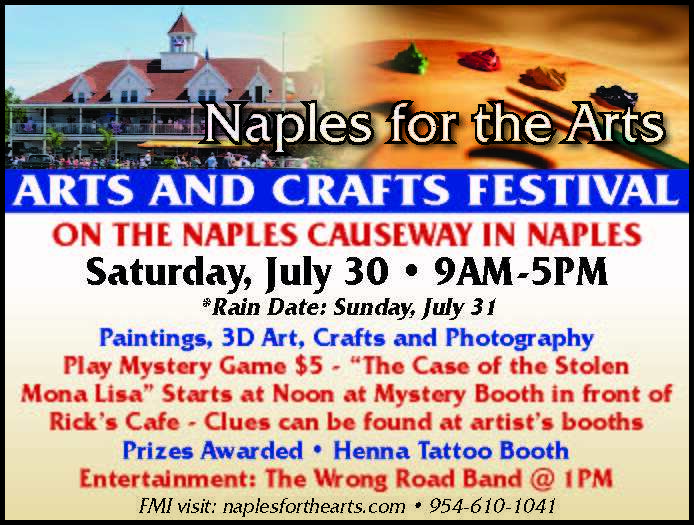 On Wednesday, August 10th at 5 p.m, people can bring their antiques and collectibles to the museum. For $5 per item, they will receive an appraisal by Harry Hepburn III, a licensed and bonded appraiser and auctioneer who has been dealing in antiques since 1971. McDermott said Hepburn has a sterling reputation in the area, and puts on a good show. “There are treasures that come through, there’s no doubt about that” said McDermott, remembering a painting on wood that had potential to be worth thousands. “It’s been very successful. We draw a good crowd, and we are hoping to have another good crowd this year,” he said. The historic dig on River Road at the site of the original 1700s fort continues at the top of Anderson Hill. State archeologists will continue work on the site for two more weeks, according to Windham Historical Society president Linda Griffin. Can you see the scissors? “They have found only a little of the fort on the Anderson Lord side and most of the artifacts are on the Parson Smith House side (93 River Road),” she said in an email to the historical society. “They have found significant items to show life in the 1700s. Next year they plan to dig under the River Road to find what buildings were inside the fort,” she added. The fort was 50 feet by 50 feet with a palisade fence outside the fort. There were two flankers holding canons and they have located a rubble stone foundation under the fort walls both the north and south walls. There was also a chimney base and possibly a small building outside the fort found, according to Griffin. This week they found a root cellar. As far as artifacts go, they have found one large coin, a clasp from clothing, a cufflink, a shoe buckle and a flattened brass thimble. Lots of nails, pieces of pottery and dozens of parts of clay pipes have been found. “It is an amazing opportunity for us to learn about our early fort and how people lived in the 1700s,” said Griffin. People interested in visiting the site are welcome to visit. They work Mondays through Thursdays from 8:30 a.m. to 3:30 p.m.
Left Corrine Bongiovanni (volunteer) and Ammie Mitchell, who has worked for MHPC for two years as an archeologist. There is a housing trend toward not only downsizing, but living tiny. A Windham couple is ready to help anyone interested in tiny homes from creating designs to building the structure. Corinne Watson and Thomas Small have built their first of many tiny homes and with the help of My Sister’s Garage on Route 302 in Windham, will host an open house this Saturday and Sunday. Watson has been a process engineer for 15 years and with her engineering background she is fascinated with tiny living. “I’m interested in building in efficiency and everything in its place,” she said. Living simply or decluttering simplifies her life, she said. When they moved to Maine they got rid of the majority of their possessions allowing the family of five to spend more time as a family and less time cleaning and organizing. “It’s a freeing feeling. You get time back. There’s nothing to clean so just go to the beach,” she said. Although they don’t live in a tiny house, Watson has discussed it before. “Not only do I want a tiny home, a lot of people do,” she said. Small designs buildings for a living. The show house is the first tiny house he had designed. It took six months to get everything right. “We put a lot of time and research in the design. It’s quite complicated to fit everything in a small space,” said Watson. The upfront design is more important, knowing how each inch will be used. From the electrical and plumbing to knowing how to fit a light switch between a window and door, Small worked to perfect the design. They contracted out some of the work and with three children and day jobs time they had to work on the project was limited. 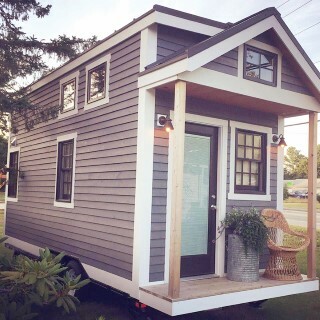 Now that they’ve launched the business, they are ready to “design custom tiny homes for people and build them.” They plan to deliver anywhere in New England. Their plan at present is to build one structure at a time, however they are offering design consulting or plans for those who want to build the tiny home themselves. There will be an hourly consulting fee for those who have Small design their tiny house. The opportunity to ask Small and Watson questions as the build happens is a perk of working with them. The open house will give the curious a chance to walk through and feel the space, Watson said. “What’s really appealing to me is getting back your time and money,” she said. With a tiny house, very few people have a mortgage. It takes a lot less time to clean a tiny house. My Sister’s Garage is staging the tiny house for Saturday’s event with many repurposed items. “It’s a luxurious space,” Watson said. “With no mortgage, no bills, no maintenance.” She said there is a lot less to pay for living in a house as small as some people’s walk in closets. The starting price for a tiny house through Tiny Homes of Maine is $45,000. The model on display is closer to $65,000 with the upgrades of flooring, stainless appliances and lighting. They can do off the grid homes working with Revision Energy. Typical builds will take between two to three months to complete. The tiny house will be good for Maine winters with spray foam insulation and a mini heat pump to keep the space warm in winter and cool in the summer. Watson has noticed that most people who are interested are not looking for a tiny house to use a primary residence, but rather as a place to stay on lakefront property or at a family camp to have their own personal space. 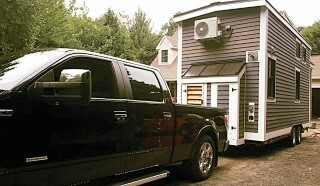 Some in Windham are interested in using a tiny house as an in-law suite. Single people with no children can use the tiny house as a primary resident and because it is portable, it works for those who like to be mobile. The Town of Windham told Watson that they welcome the opportunity for more affordable housing and that nothing in Windham prohibits tiny homes. The house is built on a retrofitted car hauler and is registered as a trailer. The space is 8 feet by 20 feet with a sleeping loft. By simplifying and downsizing, people can be saving money for the things they care about like travel, Watson said. Those who can’t make the open house can call to make an appointment to see the home. 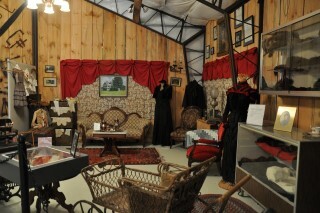 Details for the open house can be found at www.tinyhomesofmaine.com and on Facebook. They are also on Instagram, Twitter, Tumbler and LinkedIn. It’s a tale as old as time… La Belle et la Bête by Jeanne-Marie Leprince de Beaumont in 1756 was the best known version of this traditional folktale…that is, until Disney’s film version in 1991 and a highly successful Broadway run from 1994-2007. Today, with music by Alan Menken, lyrics by Howard Ashman and Tim Rice, and a script by Linda Woolverton, Beauty and the Beast is a widely popular musical choice among community theaters with high schoolers. 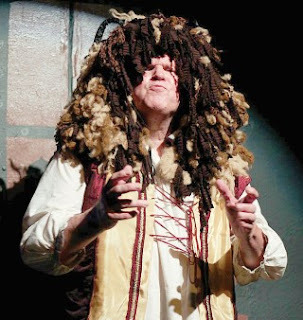 Schoolhouse Arts Center in Standish brings Beauty and the Beast to life, with all the Disney splendor and enchantment, in a production local theater fans will find charming and delightful. Directed by Dillon Bates, with the help of assistant director Adam Gary Normand, it’s a huge show with a cast of 30 whose opening night jitters were quickly replaced with an awakening of confidence that empowered them to easily push the magical fairy tale into the audience and pull them right back in (thank you, Lumiere). Beauty and the Beast tells the story of a prince who is turned into a gruff and hideous beast by a spell as punishment for his selfish ways and can only become human again if he were to find love. Belle, an adventurous young woman from a small village, finds her way to the castle where her inventor-father is being held prisoner and makes a deal with the Beast to let her father go and take her as prisoner instead. 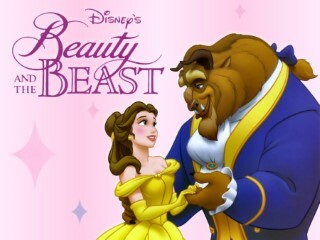 Belle proves to be a determined prisoner who is not afraid to speak her mind, while the servants of the castle, who have all been turned into household items as part of the same spell, now have new hope that the Beast and Belle can fall in love and they, too, can become human again. It’s a monumental task, a journey filled with twists and surprises, and lots of evil forces to fight along the way, but ultimately—with some coaching, bending, changing, civility and forgiveness—the goal is achieved. 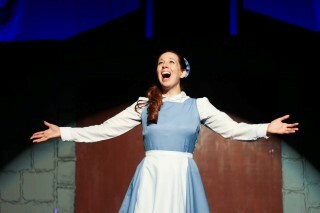 Janelle LoSciuto as Belle and Tom Ferent as the Beast are superb and convincing. LoSciuto’s Disney-esque ingénue, carefree characterization and clean, crisp vocals play well against Ferent’s struggling antagonist with intense, purposefully-placed delivery. Zac Stearn is outstanding as Lumiere. His stage skills are top notch but his animation is especially captivating with priceless expression (think Jim Carrey). Also impressive were Danny Gay as Cogsworth (and lighting designer) and Barbara Laveault as Mrs. Potts, Sarah Flagg as Madame De La Grande Bouche and Katie Lind as Babette. Jake Boyce commands two roles—choreographer and a very entertaining Gaston. His sidekick, LeFou, is adeptly handled by Jeff McNally. Chris Roberts plays Maurice, Kaylin Brown is Chip and Louis King is Monsieur D’Arque. The Silly Girls—Corinne Sophia Ulmer, Sophia Cartonio and Anna Giroux—are fun scene stealers. The ever-busy Ensemble deserves a standing ovation: Jacob Clowes, Josh Davis, Cara Kennedy, Lisa Libby, Valerie Lind, Sarah Morin, Meghan Reidy, Angel Spiller, Abigail Thomas, Emily Thomson, Livi Vail, Bridget Daigle, Kianna Hubbard, Jack Lamont and Diane Ruecker. Music director Allen Thomas skillfully leads an admirable perfectly-placed nine-piece pit that provides nicely balanced support for all the singing. And for this show, the singing is magnificent. This is home-town Maine summer community theater at its best. Disney magic aside, there’s something quite magical about an old schoolhouse, a charming rustic building now supported with patches of love and attention. When you walk in, you notice it’s a weathered building, in need of dusting, washing, painting, normal things, with rooms dotted with donated items and leftover pieces and writings from past events. It’s not the neatest house, but it’s the busiest house in the neighborhood, where kids flock to create and explore. Beauty and the Beast has several morals and cultural clichés for the audience to ponder: Most obviously never judge a book by its cover, beauty is in the eyes of the beholder, beauty is not only skin deep but can be found in the heart, and hearts can change. There’s also redemption found in the Beast’s transformation from a mean bully to a nice guy. In its first published version written by French author Gabrielle-Suzanne Barbot de Villeneuve in 1740, the story was intended for adult readers and addressed the issues of a marriage system in which women had no right to choose their husband or to refuse to marry. 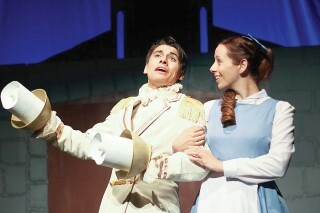 So if the lesson is to never judge by appearance, Schoolhouse Arts Center’s Beauty and the Beast is a perfect choice. Don’t hesitate to be their guest! Beauty & The Beast runs thru July 31st on Thursdays, Fridays and Saturdays at 7:30 p.m. and Sundays at 5 p.m. The theater is located at 16 Richville Rd (Route 114) in Standish. FMI, visit www.schoolhousearts.org or call 207-642-3743.